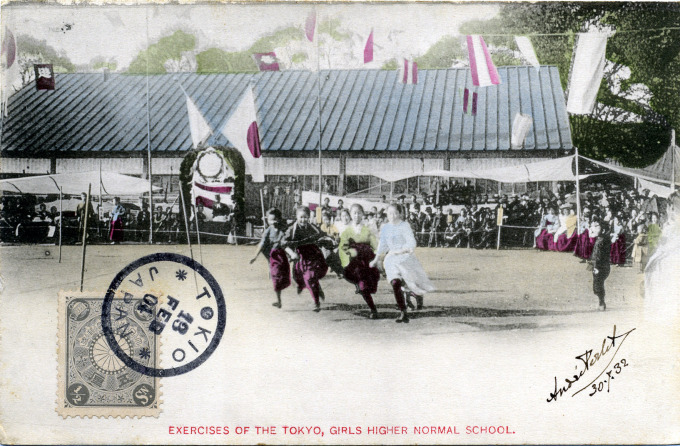 “In 1882, the Government opened the Koto Jo Gakko (Girls High School) as a part of Tokyo Girls Normal School established 1874, with the object of giving girls a higher common education mainly based on the principles of humanity and morals and of teaching them to become good and virtuous women. About the same time, female schools of a similar description began to be established in different parts of the country. Coming next to women’s normal education, the Tokyo Joshi Shihan Gakko (Tokyo Women’s Normal School) was established by the Central Government in 1874, an example which was followed by the different prefectures. Sports days [undoukai] are still ubiquitous at all levels of Japanese education, and last all day. Some schools take them more seriously than others. This postcard image, postmarked 1904, shows girls in a race around the athletic field at the Tokyo Girls Higher Normal School, near Ueno Park, Tokyo — one of only two higher normal schools for girls in Japan (the other was located at Hiroshima) during the Meiji Era (1867-1912). Higher normal schools were, for all practical purposes, teaching colleges. A graduate would commit to work as an elementary school educator, anywhere from 2-5 years after, somewhere in Japan. Much of their student tuition (including dormitory room, board, textbooks and clothing) had been paid for with State funding. The Tokyo school was founded c. 1874, one of the very earliest education reforms proclaimed by the Meiji government after the Restoration. Six years of education were compulsory (in 1904, only 34 US states had a compulsory education requirement to the 6th grade). Promising compulsory school graduates were then offered additional matriculation streams, by the State, at higher normal schools and universities in exchange for public service. The original campus was destroyed in the Great Kantō earthquake (1923). In December 1932, a new campus was established at its present location in Tokyo’s Bunkyo ward. After World War II and the post-war education reformations, the Tokyo Girls Higher Normal School became Ochanomizu University, one of only two national women’s universities in Japan.